Instead, Fadell says that the futuristic design and pleasant interface of the device is encouraging people to interact with it much more than they ever thought. “60-70% of customers are using the Leaf.” says Fadell, referencing the energy efficiency indicator symbol that appears when a Nest is at the optimum temperature for savings in a particular season. That Leaf symbol is a reward, it acts as “bonus points” that people can shoot for, and that’s helping Nest users be more energy-efficient. And it’s not just young ‘hip’ people that are using the Nest either. 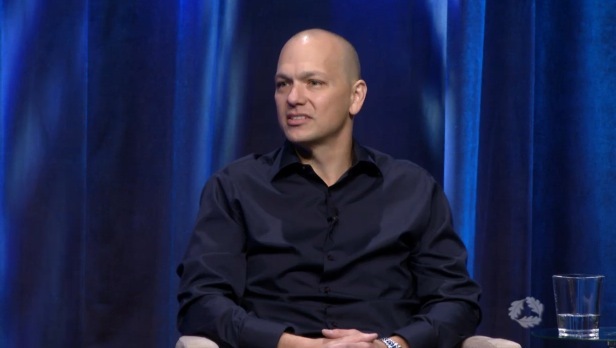 “The demographic is from 20-70 year olds that are using the Nest,” says Fadell. “Our job right now is building the market, informing the market,” said Fadell in response to a question about whether Nest was going public any time soon. “We didn’t make any money on the iPod for years,” he said, adding that their job was to bring it to the world right now. “If you thought of a product as something that was designed to be plugged into a finite battery, the fundamental design of every one would change,” he said. Currently, many electronic devices are designed to take advantage of an ‘unlimited flow of electrons’, rather than power savings. This, says Fadell, is something that will have to change over time. He also addressed whether the Nest was built for ‘techies’ only. He noted something that has been close to my heart, which is the fact that the next generation of consumers is going to be familiar with touch interfaces like those on Android devices, the iPhone and iPad. The kinds of interfaces like those found in the Nest and its remote apps will be second nature to these users.